The second year cast of Harry Potter and the Cursed Child on Broadway was revealed this week, just in time for their premiere this Wednesday evening at the Lyric Theatre in New York City. Included in the photos are James Snyder as Harry Potter, Diane Davis as Ginny Potter alongside Nicholas Podany as their son Albus Potter; Matt Mueller as Ron Weasley, Jenny Jules as Hermione Granger and Nadia Brown as their daughter Rose Granger-Weasley; and Jonno Roberts as Draco Malfoy and Bubba Weiler as his son Scorpius Malfoy. 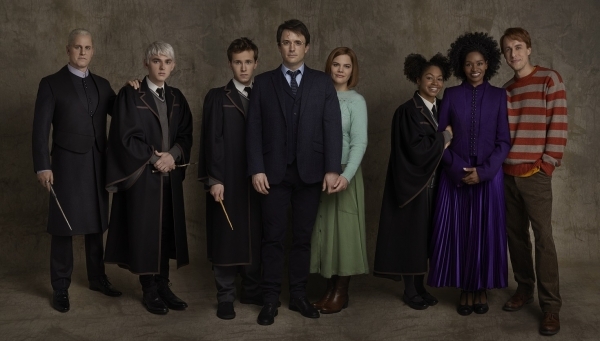 Ahead of the new Broadway cast’s first performance at New York’s Lyric Theatre (214 West 43rd Street, NYC) tomorrow, Wednesday, March 20th, the Producers of Harry Potter and the Cursed Child have released a first-look set of portraits by Matthew Murphy. Seen in character for the first time are James Snyder as Harry Potter, Diane Davis as Ginny Potter alongside Nicholas Podany as their son Albus Potter; Matt Mueller as Ron Weasley, Jenny Jules as Hermione Granger and Nadia Brown as their daughter Rose Granger-Weasley; and Jonno Roberts as Draco Malfoy and Bubba Weiler as his son Scorpius Malfoy. Ms. Farb and Ms. Reid are appearing with the support of Actors’ Equity Association. The producers gratefully acknowledge Actors’ Equity Association for its assistance to this production. Harry Potter and the Cursed Child is the eighth story in the Harry Potter series and the first official Harry Potter story to be presented on stage. Based on an original new story by J.K. Rowling, Jack Thorne and John Tiffany, Harry Potter and the Cursed Child is a new play by Jack Thorne, directed by John Tiffany. The production is presented in two parts. Receiving universal acclaim for its breathtaking magic and stage wizardry, Harry Potter and the Cursed Child is the most awarded play in theatre history, winning 25 major U.S. awards, with six Tony Awards including Best Play. It also won 24 major theatre awards in the U.K. and is the most awarded show in the history of Britain’s Olivier Awards, winning a record-breaking nine awards including Best New Play. Harry Potter and the Cursed Child is now playing at the Palace Theatre in London, where it received its world premiere in July 2016; at the Lyric Theatre in New York, where it opened on Broadway in April 2018; and at the Princess Theatre in Melbourne, where it opened last month. Upcoming productions include the exclusive U.S. West Coast premiere in San Francisco at the Curran later this year and the German premiere, the first foreign language production, at the Mehr! Theater am Großmarkt in Hamburg in spring of 2020. Harry Potter and the Cursed Child features movement by Steven Hoggett, set by Christine Jones, costumes by Katrina Lindsay, music & arrangements by Imogen Heap, lighting by Neil Austin, sound by Gareth Fry, illusions & magic by Jamie Harrison, music supervision & arrangements by Martin Lowe. US Casting by Jim Carnahan, CSA. UK Casting by Julia Horan, CDG.